Welcome to the Cam CC Ladies Section. 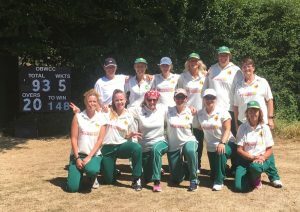 Formed in 1989, has a strong committee and through the development of girls in our Youth Section, as well as the introduction of adults to a new sport, has proved to be sustainable when other women’s cricket sections have struggled. It has been fully supportive of the development of Women’s League Cricket and representative women’s cricket in Gloucestershire. We are a dynamic and sociable cricket team, but we aim to be competitive at all levels. We welcome complete beginners, but also aim to excel in league games and develop all our members. There are lots of opportunities to also become involved in Cam Cricket Club, with numerous members having become qualified coaches, volunteering with coaching the youngsters, attending committee meetings, contributing to fundraising and enjoying the friendly atmosphere of the club. The Cam CC Ladies team will be playing in the Gloucestershire CB Womens league during the 2018 season. Cam Ladies entertained Bristol YMCA on Sunday on a beautiful sunny day for a friendly. Cam were put in to bat first with opener Laura Manley pushed up the batting order and Liv Hughes. Cams first wicket fell with 20 on the board Laura LBW for 3. Sinead joined Liv who in her usual aggressive mode was hitting well but she was bowled for a creditable 34 which included 7 4s. Dani caught behind for 2 then brought Jane to the crease and after a slow start she started to pick up the pace scoring 5 4,s before getting herself out by hitting her wickets for 32. Lucy Johnson didn’t waste any time with overs running out she was hitting some good shots finishing on 26 no which included 5 4s. bringing Cams total to 139. A much improved YMCA set about their task of 140 to win Sam Martin took the first wicket with only 6 on the board. Captain Dani introduced several new bowlers who all went about their tasks Abi Wilson with a caught and bowled Ellie Booth with a catch Liv taking 2 wickets and Dani with a run out. This was a good performance in very hot conditions. Cam Ladies travelled to Old Bristoltians on Sunday for an early 10am start. These encounters between the two sides have always been close matches. Captain Dani lost the toss and was put in to bat first. Openers Ali Dixon and Liv Hughes in their usual aggressive manor set about getting a good total for OB,s to chase. Both playing well before Liv was bowled for 15. This brought Leanna Ashford to the crease and she made a quick 5 then being bowled out. Sharon Bates also made a quick 6 and she too was bowled. Captain Dani joined Ali and the two of them took the bowing apart capitalising on the bad balls Dani playing the wrong shot was eventually bowled out for a commendable 25. Ali was joined by Nicola but she was caught and bowled for 1. Ali finishing on a BRILLIANT 71 no, not realising that she had passed her 50 which included 5 boundaries . With a good total on the board Cam set about their task first wicket in the first over a great catch from Ali Dixon off the bowling of Liv. Cam continued to take wickets Liv taking 3 wickets in her first 3 overs OB,s showed some resistance but with overs running out Kate Bendall ran out Claire Beasley with the last ball of the match finishing on 93 for 5. Captain Dani Bennett was very pleased with Cams batting and fielding. Special mention to Ali Dixon for her 71no and Liv Hughes for her 3 wickes in 3 overs.